Running aground can happen to the best of us, but when stuck fast what is the most effective way to free your boat? Whether you go to sea under power or sail, you’ll almost certainly find yourself aground at some point in your on-water career. It’s one of the hazards of the sport – you could even argue a fair case that if you haven’t gone aground at some point, you haven’t been trying hard enough. What marks out good seamanship in this case is where you do it, and how you deal with the problem. Going fast aground on a rocky foreshore with a falling tide is highly hazardous for both boat and crew, so your passage planning should allow plenty of room for error to avoid it. On the other hand, gliding gently to a standstill on a sandy shore with plenty of tide in hand to lift you off again is little more than an embarrassment. In this year’s Round the Island race the Inshore Rescue boat was called to help 14 yachts stuck on the Isle of Wight’s Ryde Sands, which is probably a fraction of those who found themselves briefly embraced by the putty before resuming their race. 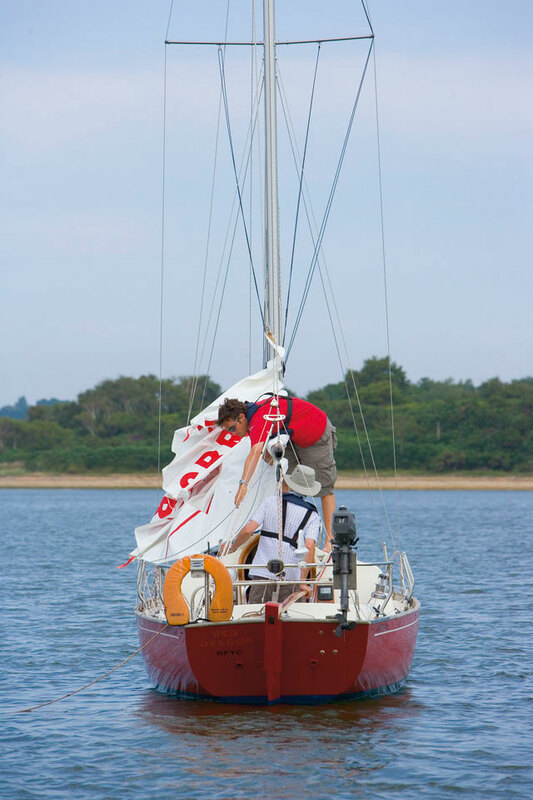 As any Solent yachtsman will know, Ryde Sands are steeply shelving and can grab your keel in the space it takes to tack, but the benefits of weak tide in the area make a compelling justification to push your luck as far as you dare. If you get it wrong, the penalty is a red face and a lower place in the race results than you might have expected – hardly a life-threatening situation. This feature deals mainly with those fairly safe but embarrassing situations, which for most people will represent the outstanding majority of their grounding experiences. It’s an impossible task to set down a formula for what you should do if you go aground, as there are so many variables to consider: keel configuration, state of tide, wind direction, engine power, fitness and enthusiasm of the crew to name but a few. What is worth doing however is having a range of techniques up your sleeve and the confidence and quickness of thought to use them when the inevitable happens. It could save you an unhappy few hours on the mud absorbing the baleful glares of your disillusioned crew. Like every aspect of sailing, the key is to be in control of the situation. In the Round the Island race every one of those sailors knew the risk of running aground, but chose to take the risk. I’ve run Red Dragon aground while trying to beat down the narrow channel on the west side of Brownsea Island in Poole Harbour. There’s not much water even in the middle of the channel, and the edges move on occasion, so there is always a risk. However, the bottom is soft mud, and on a rising tide the risk of a gentle grounding is more attractive than having to lower the sails and start the engine. The key words in that last sentence are ‘on a rising tide’. Wherever you sail, whether strange or familiar waters, you should always know what the tide is doing. For home waters it’s often enough to know when high and low water occurs, and hence whether the tide is rising or falling. In strange waters, you should plan your passage carefully, examining the charts for any shallow areas along your route and working out the tidal heights for the time you expect to be there. The margin for safety you need to leave will vary according to the risk from the type of bottom, state of tide and sea state, but in unfamiliar waters it always pays to err on the side of caution. The axiom that knowledge is power continues after a grounding occurs. If you run aground, the likelihood is that safe water lies in the direction you have just come from, but if the tide is rising it can pay to make a quick survey of the area where you have gone aground. A survey can be as simple as walking around the boat plumbing the depth with the boathook or spinnaker pole, or you may choose to extend the area a little by climbing into the dinghy. The idea is to find out the nature of the seabed – have you grounded on a shelving shore or a narrow spit? Do you need to come off in exactly the direction you came, taking advantage of the furrow your keel has probably ploughed in the mud or sand, or could you twist off by finding some way to move the bow around? 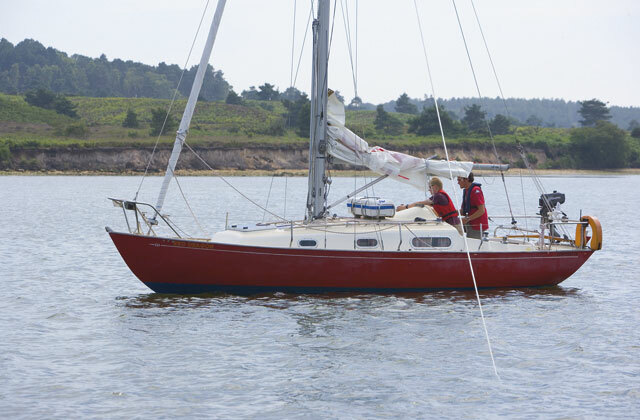 For sailing boats, the most common cause for grounding is when you are tacking up a channel and push the edge a little too far. If you spot the telltale slowing of the boat before you completely stop, the first thing to try is to use any remaining momentum the boat has to tack. 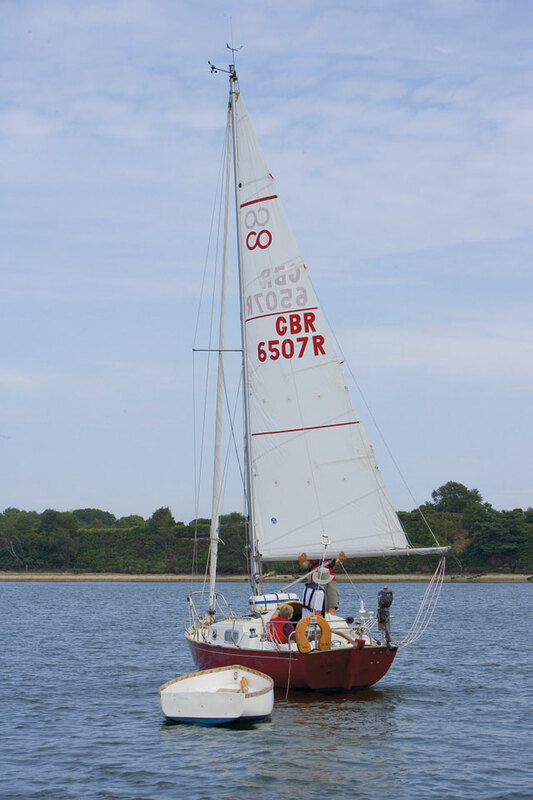 If you can get the bow through the wind, the battle is almost won – even if the boat has stopped you can often get her moving again by sheeting the sails in hard to increase heel and reduce draught, or spin the bow further off the breeze and hopefully into deeper water by backing the jib. 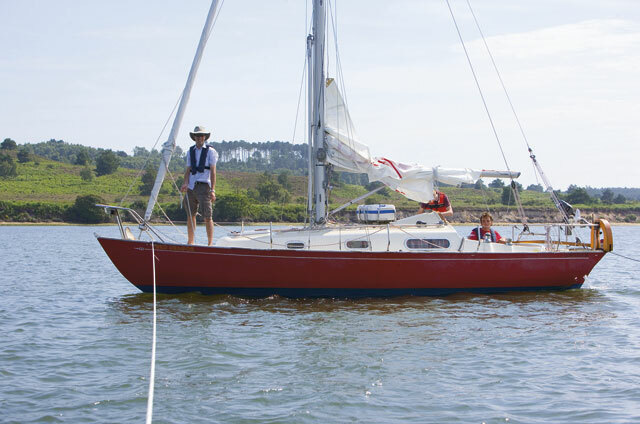 This method is particularly effective on long-keeled yachts as the keel is often significantly deeper at the stern than at the bow, but is worth a try on most boats. Move any weight you can think of to the bow – crewmembers are good – to push the bow deeper into the water and in turn lift the stern of the boat. This is often enough to float you off again, and has the added benefit that it tends to lift the rudder clear of the mud, regaining steerage. An added technique to this method is to get your crew to bounce in unison. Not only does it offer comic entertainment to passing boats, it’s a good way to break the suction a sticky bottom can have on a grounded keel. A similar effect can often be obtained from the wash of a passing powerboat – you could even try asking a friendly jet-skier to run rings around your boat to create some wash! For any kind of boat, the key to getting off the bottom is to reduce draught. Lift-keelers have it easy here, but for single-keeled boats, one of the easiest ways is to increase the heel of the boat. 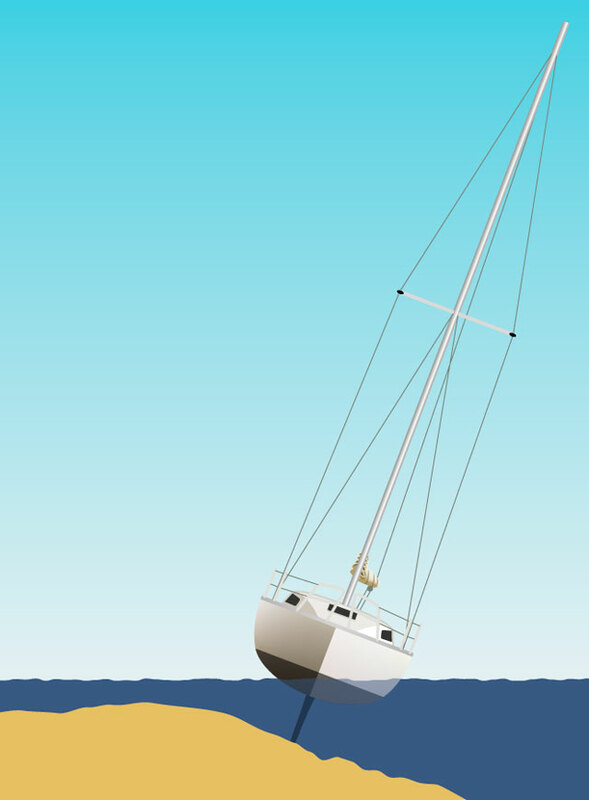 If you have gone aground while going upwind then the boat will probably be heeled already, but if you can increase the heel then you reduce the draught still further and stand a chance of getting off. 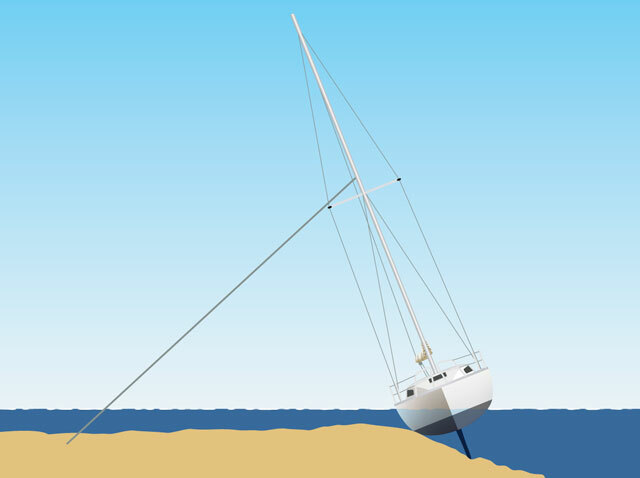 If you have gone aground when going downwind, heeling can be even more effective as the boat was probably sailing upright, but in both cases it’s essential to have a strategy in place to move the boat away from the shallow water – for example, laying a kedge or going astern under sail or engine. If you simply reduce the draught you will probably just blow further aground. Sometimes just moving crew weight to leeward might be enough, but you can have more effect if you use the boom as a lever. Apply the topping lift and hang some weight from the boom – a bucket of water, the anchor, a partially-filled dinghy or even a crewmember. Bear in mind that this technique will not work for a bilge-keeled boat, as heel will push the leeward keel deeper into the ground. 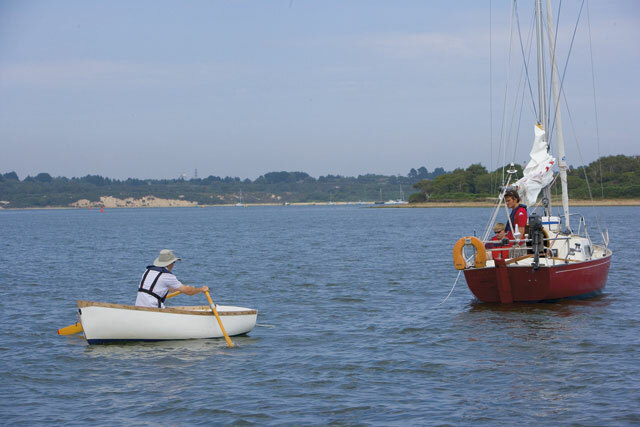 For small boats in light winds, this time-honoured dinghy and keelboat technique is worth a try if you have gone aground while going upwind. Drop or furl the jib and get one or two powerful crew to haul the boom to windward, staying to windward of the boom in case the wind gusts and they can’t hold on. This is a powerful way to push the boat astern, and also provides a turning force that will try to push the bow through the wind. 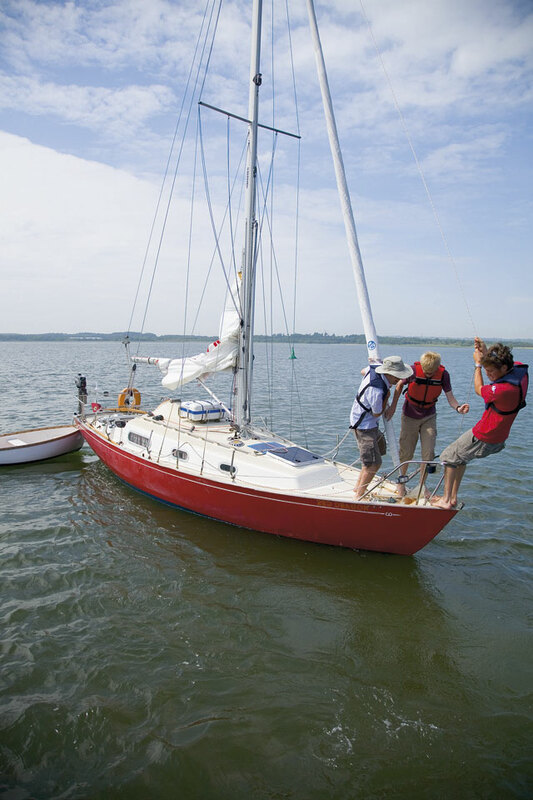 If that happens, a backed jib can help continue the turn to twist the boat off the mud, or you may be afloat and able to sail off on the opposite tack to that which you went aground. The drawback of this technique is that the forces on the mast tend to push the aft section of the keel deeper into the mud, so it’s often best to combine it with crew weight on the bow. If you can’t get the sails to do the work for you, you need to find some other form of motive power to get you off the bottom. The obvious choice is the engine, but if that’s not an option owing to race rules or an engine problem, you’ll need to think of something else. If the bottom is firm it’s worth trying to push off with the boathook or spinnaker pole – Norfolk sailors will be familiar with the efficiency of this technique when using the 24ft quant pole carried by most Broads yachts, but the available poles on most seagoing yachts are too short to achieve an effective angle for pushing off. Another possible approach if your crew is keen enough is for somebody to go over the side and push, or with smaller boats even lift the stern slightly. It’s a common approach for getting a boat back into a race – just be sure the bottom is firm enough for your volunteer to stand up, and that you aren’t about to sail away and leave them planted in the mud. Any fan of naval history will know of Nelson’s ships jettisoning stores and cannons for a fraction of a knot of extra speed or a few inches of draught. The penalty for modern yachts and motorboats going aground is unlikely to be a storm of gunfire, but the technique is still valid today. 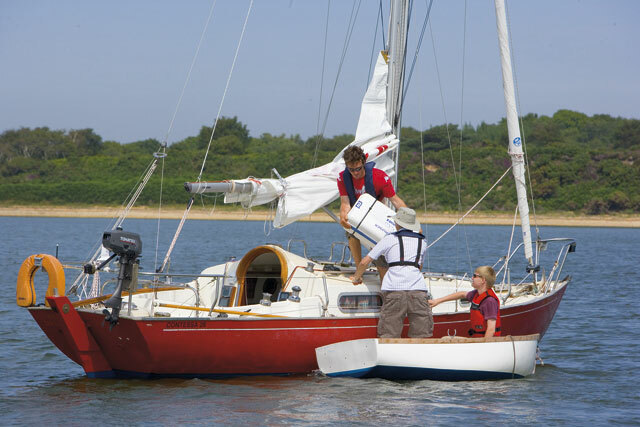 Try offloading heavy objects such as the liferaft, jerry cans, outboards and spare crew into the dinghy. Sometimes it’s enough to reduce the draught or break the suction, and can make the difference between success or failure for any of the other techniques listed here. Kedging is one of the most powerful weapons in the sailor’s armoury when aground. It’s main drawback is that, unless you have a system for quickly launching the kedge, the required lines and equipment can take some time to set up. It’s also messy, and hence usually a last resort. That said, the idea is simple. Most kedge anchors are rigged with a short length of chain attached to a long warp. Make the end of the warp fast to a cleat on board and lower the kedge into the dinghy, flaking the chain and warp in after it so that it can run easily over the stern of the dinghy. Don’t try it with the chain hanging over the transom – it will serve to continually pull you back towards the yacht. Row away to the extent of the kedge rode in the direction in which you would like to move the boat, and drop the kedge into the water. You can now use a cockpit winch or the anchor windlass to try to pull the boat off the mud. 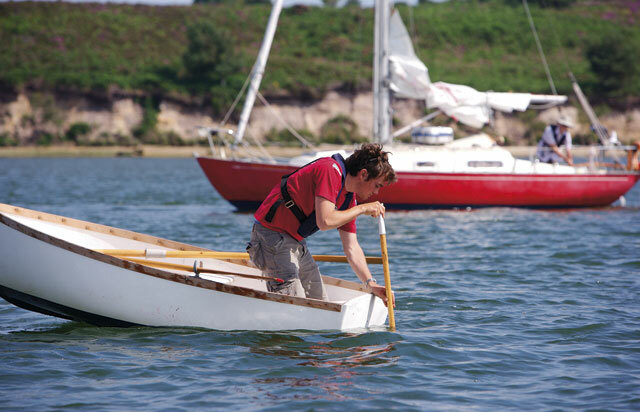 Don’t be tempted to use the bow anchor for this technique, especially if you have an all-chain rode – it’s heavy to manhandle and difficult to row. For a stern kedge the cockpit winch is usually the most successful, as you can pull the boat along the furrow ploughed by the keel and back towards deep water. However, in soft mud the twisting action of pulling the bow round can be a good way to break the suction holding the keel. Another use for a kedge is to heel the boat. Drop the kedge as described for kedging off, but row it out abeam of the yacht and make the warp fast to a halyard. Taking in on the halyard will then use the mast as a lever to heel the boat. This is an extremely powerful way to provoke heel and can dramatically reduce draught when used with care. The problem is that the steep angle from the masthead will tend to break the anchor out, so it pays to use as long a rode as possible. 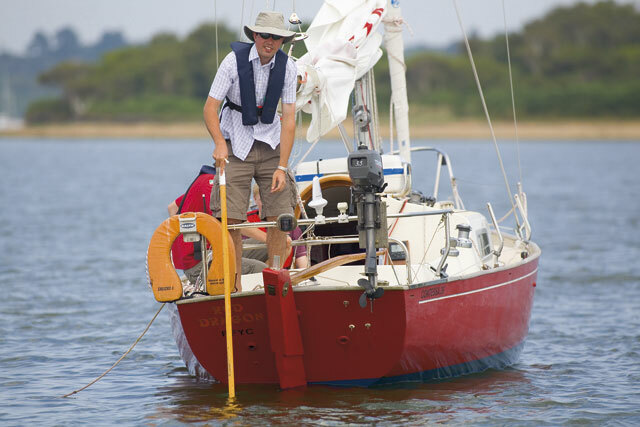 A neat alternative solution for both this technique and ordinary kedging is to use a convenient mooring buoy or even a line ashore if appropriate. 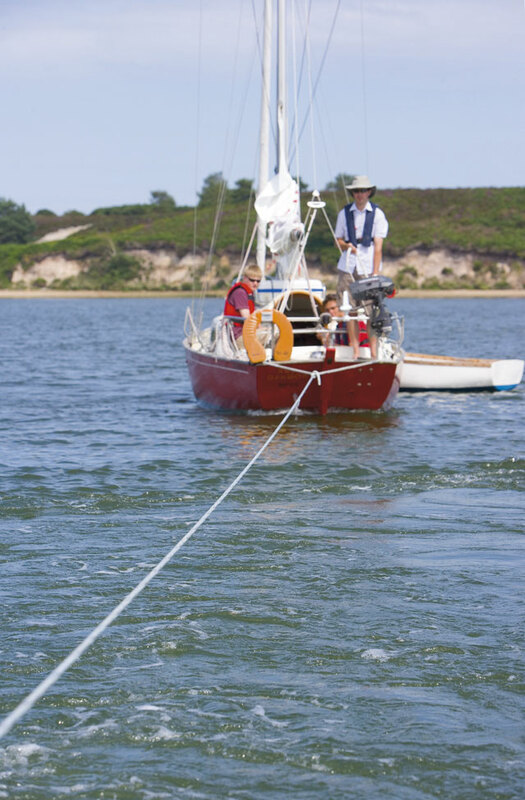 Taking a tow can seem like admitting defeat, but there’s no question that the most effective way to get off when aground is to take a line from another boat which is in deep water and has room to manoeuvre. Don’t assume that the person offering you a tow is an expert, so think carefully about how you would like to use their offer of assistance. You generally have two options: to be towed stern-first the way you came, or to take a line from the bow and try to twist the boat off. Being towed stern-first is generally the kinder option, although like backing the main it will tend to pull the stern deeper into the mud. Crew weight on the bow can help here. Most boats will need to rig a bridle between the aft cleats in order to spread the load, and it’s a good idea to keep one end of the bridle in hand ready to uncleat if you feel the need to drop the tow in a hurry. The same applies when towing from the bow: cleat the line with a couple of turns, but be ready to release it if you suspect trouble. If you plan to help with your own engine, ensure that there is no way you could snag the towing line with your own propeller. Like all team efforts, communication is key. Talk to the skipper of the towing boat and discuss what you would like to do, and arrange a system of hand signals so that you can ask them to start, increase power, reduce power, stop or change course. Finally, bear in mind that the forces involved can be considerable. Use the thickest line you have, only make fast to strong points on board and make sure that the crew are clear of all lines. And if it becomes obvious you are not going to move, know when to say stop. Only offer a tow if you are sure you can keep yourself out of danger. There’s no point in two boats drying out. How you rig the tow depends largely on what kind of boat you have. If you are on a yacht, most yacht engines are much more efficient in forward gear so it makes sense to rig the tow from your stern. For powerboats it may be better to go in reverse and tow from the bow – the engines are almost as good in astern, and it keeps your propellers in deeper water. Another reason is that often the strongest fixing points are on the bow of a motorboat. The most important thing is to retain control of your own situation. When you discuss how you plan to carry out the tow with the skipper of the stranded vessel, make sure your agreed hand signals have a clear way to communicate if you need to cast off and abort the tow. For the same reason, have a crewmember with the tail of the cleated line in hand, ready to cast off just in case you find yourself running into danger. The most likely problem you will find is that having effectively anchored yourself by bow or stern you begin to drift downtide onto the same shallows that are holding the other vessel. Yachts and single-screwed powerboats need to offset this with some opposite rudder, or if you have a twin-screw vessel do most of the work with your downtide engine. 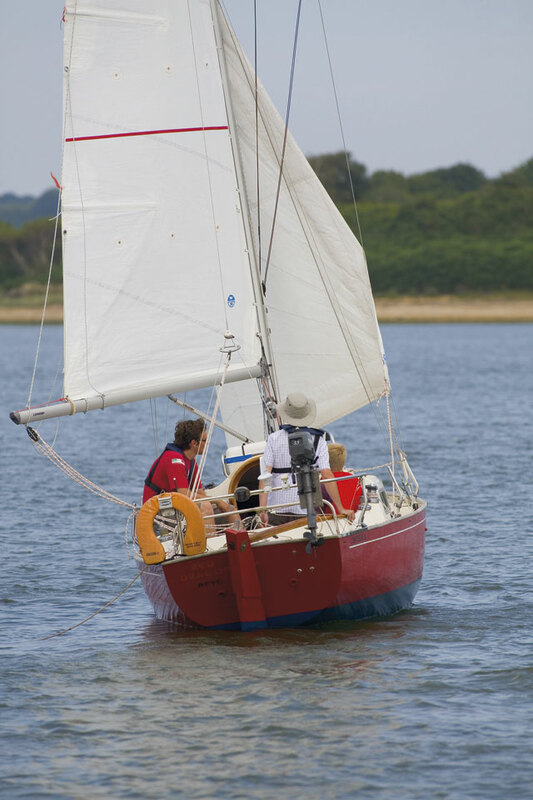 All of the techniques covered are useful to remember, but most cruising sailors on going aground will drop the sails and put the engine hard astern. And it’s nearly always the right decision – unless you can quickly spin the boat off the mud by tacking, the engine is likely to offer the fastest way out of trouble. Adding in some of the other techniques such as weight on the bow or heeling the boat can help make it more effective, while the engine provides a positive force to move the boat in the right direction, away from danger. Dropping the sails is often a good idea to avoid any risk of the boat powering up, although if you have gone aground upwind it’s usually enough just to roll the genoa and make sure the main has plenty of sheet. But whatever you do, take a moment to check for lines – it’s all too easy to drop a line over the side or pick up the painter of a towed dinghy, fouling the prop and making the problem much worse. For powerboats, going astern is the obvious first choice. Weight forward can help, or twin-screw vessels can try varying which engine has most power, twisting the boat from side to side to break the suction. Single screw boats may well find the rudder is stuck fast, but if you can move it, try lashing it to one side to provide a slight twist and to start your turn towards safety when the boat comes off. It’s rare that using the engine ahead will help, but if you’ve surveyed the depth around the boat and have concluded that all that’s holding you is a narrow spit of soft mud or sand, you may just need a little power to push the keel through and into deep water again. However, you need to be absolutely confident that you are heading into safety or you may just drive the boat harder aground. Bear in mind that motoring forwards drives the stern deeper into the water. If you’ve tried everything and there’s no way you can get off, you’re probably in for a long wait until there’s enough tide to lift you off again. Now is a good time to alert the coastguard of your position. It may not be necessary for them to do anything, but they will certainly monitor your circumstances until you return to safety, and your first priority is to ensure the safety of the crew. Take the time to work out exactly what you expect the tide to do over the next few hours. It may be enough to row your kedge into deep water and drop it in position to stop the boat drifting further aground as the tide rises. If you’re on flat mud or sand and the weather is calm, then boats designed to take the ground need do little more than wait. The same applies to single-keeled boats if the tide will not drop enough for them to fall over. Even if the boat will completely dry out, you can climb overboard and stuff all your fenders and any other padding under the side as she takes the ground. Heavy seas or uneven ground can make the situation dangerous. Many vessels, large and small, have been broken up through running aground in rough weather, and in this situation there’s little you can do but try to strap some padding into place before the lifeboat takes you to safety. Anything will do: cushions, sail bags, even a half-inflated dinghy. With uneven ground, you need to make sure that you don’t settle onto something that could hole the hull, and that by falling over your boat is not at risk from flooding as the tide comes in. The textbook situation is where you have run aground on a bank and the boat falls over with the mast pointing downhill. As the tide comes in, it comes through any open vents and fills the boat. The solution to this is the same as described earlier: use the kedge from a halyard or pole uphaul. By rowing the kedge out, you can use it to control the direction in which the boat falls over, resting it uphill on the bank ready to float. 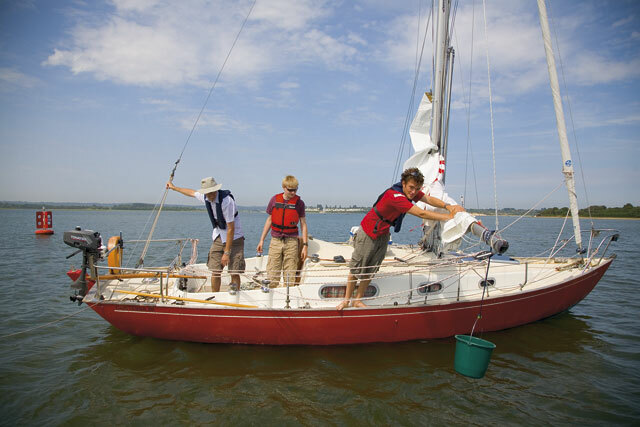 The same technique can help to avoid an obstacle which might damage the boat as she dries out, or you could try to remove or pad the object. Preparation is essential both to avoiding running aground and to dealing with it when it happens. If you know your boat well, you’ll know the best techniques to get her afloat as quickly as possible, or you may decide not to worry about it and wait for the tide – I remember a grounding in Poole which lasted just long enough for us to have dinner, while many sailors in shoal waters have spent a few hours propped on their bilge keels drinking tea. There are situations in which grounding could be extremely dangerous, but by careful planning you can minimise the risk. For most of us though, perhaps the hardest obstacle to overcome in going aground is personal pride. Be prepared to take a tow when offered (see panel, left) and if in doubt, call the coastguard. They always prefer to know about a problem before it becomes an emergency.